Chalet. in Gerbepal, 8 km from Gerardmer: outside the resort, 8 km from the lake. 2-room chalet 51 m2, on the upper ground floor: living/dining room 20 m2 with 1 double sofa bed, digital TV, video, radio and CD-player. 1 room with 1 double bed. Gallery with sloping ceilings with 2 beds. Kitchenette (4 hotplates, oven, dishwasher, micro wave, freezer, electric coffee machine). Bath/WC. Electric heating. Terrace 20 m2. Facilities: washing machine. Maximum 1 pet/ dog allowed. Utility room with washing machine in the basement. Access to the upper floor is via a steep staircase. Gallery with sloping ceilings: 2 m/1m. Chalet on slope with view of mountain and valley. It is situated below the main street. The ground floor is elevated. Private: grounds 500 m2. Garden furniture, barbecue, individual garage. 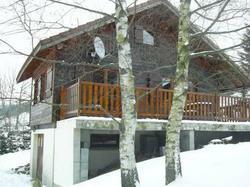 Grocers 400 m, restaurant 600 m, bakers 400 m, outdoor swimming pool 8 km. Golf course 26 km, tennis 8 km, ski runs 8 km. Please note: car essential. - A fully refundable security deposit of 250 EUR will be required upon arrival for damages. - Bed linen (Initial supply) is available for an additional cost of 11 euros per person. - Towels (Initial supply) are available for an additional cost of 4 euros per person.